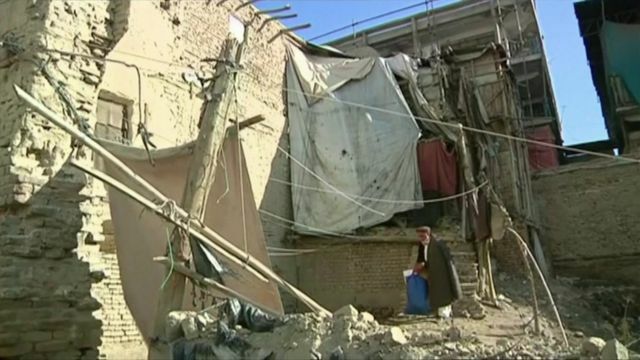 Afghan-Pakistan quake: Rescue intensifies Jump to media player Rescue efforts are being stepped up to help those affected by the strong earthquake which hit remote areas of Afghanistan and Pakistan on Monday. Peshawar: 'Nothing to hold on to' Jump to media player Eyewitness Naveed Ahmad Khan describes the moment a large earthquake struck when he was in his office in Peshawar, Pakistan. Moment quake hits Kabul TV studio Jump to media player A presenter on Kabul's Ariana TV was forced to leave his desk as an earthquake hit. Tremors have been felt in Pakistan and northern India as well as northern Afghanistan. 'Panic and chaos' as quake hits Kabul Jump to media player A powerful earthquake has struck northern Afghanistan, with tremors also felt in Pakistan and northern India. Rescue efforts are being stepped up to help those affected by the strong earthquake which hit remote areas of Afghanistan and Pakistan on Monday. The BBC's Shaimaa Khalil reports from Kabul.